If you're afflicted with bad vision please try to remember that you can use your other senses to shoot people, get around, eat beans, as well as star in the following 90 minute movie made in 1964. 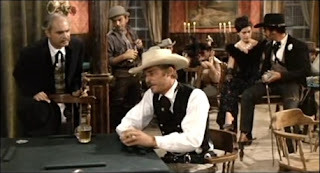 It was Directed by: Sergio Corbucci; and Starred: Cameron Mitchell, Georges Riviere, Ethel Rojo, with Diana Martín. Hey, Mister Clay (Cameron Mitchell)! I'm so happy to see you again, my friend. Ever since you went away two rival groups of bandits have managed to take over the town. And in process one faction of this group has had the audacity to appoint one of their own into becoming the new town Sheriff. I'm sure you've heard of him before! Cause it's your old advisory -- Fox (Georges Riviere). But hey! Now you're back I bet you anything you'll be able to kick him into touch no swe... swe... eh? What seems to be the matter, Clay? Come on, man. Speak up! Are you worried about loosing your vision to some rare disease? Or are you concerned that the authorities will track you down since you bust out of prison? Or better yet, are you troubled about revealing your true identity to your estranged daughter, Lucy (Diana Martín)? Then again, that's most probably why what next transpires all goes from bad to worse when you say to me, 'Shut up, Scratchy (Gino Pernice). Can't you see that a semi-blind man has to do what a semi-blind man has to do?'. As a bunch of bandits get caught in their own trap - that scab named Fox isn't a very nice chap - a lone gunman shoots with the aide of sound - and at the end of the day, get ready to cart off another bad-guy to the nearest impound. 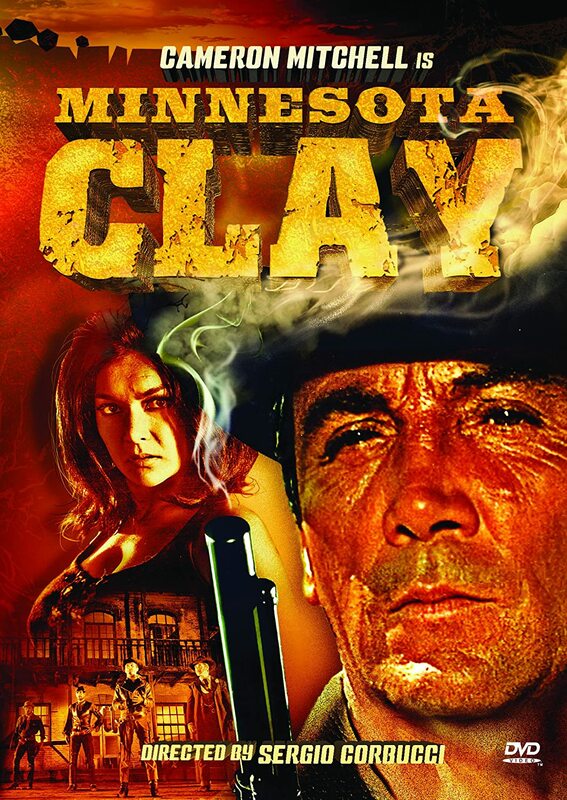 In my most humble opinion 'Minnesota Clay' is a very good film, yet only if you enjoy following a story-line that's rather a-typical for this sort of production. For instance, you have a main protagonist who isn't always perfect but manages to get there in the end. Then you have a number of bad-guys and good-guys who one way or another serve the purpose of the plot. Plus to top if all off there's the usual dose of operatic music, rustic visuals, dodgy dubbing, as well as, well, you know the sort of thing I'm sure. Now please don't get me wrong, dear reader. I'm not trying to imply anything negative here. As I stated previously this is a very good film. And it does manage to entertain you if you like watching this sub-genre of adventure. What I personally liked about it the most were those occasions where the narrative tried to do something different from the norm. Like that scene where the Clay character offered to turn himself in so he could help his friend's out financially. Or those scenes where Clay used sound to gun down the bad guys due to his dwindling vision. But as for everything else, though, well, yeah, they were good I suppose. Although to some extent I've seen estranged daughters, humble friends, Mexican bandits, sultry swindlers, and old adversaries, so many-many-many times before, I think I'm starting to become immune to their charms. Again, my friends! Please don't get me wrong. Cause I do mean this with all due respect. Plus I'm positive if I viewed this picture from a less jaded perspective I'd put it in a much better light! 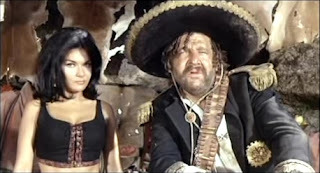 Especially since Cameron Mitchell gave some real depth to his sullen performance, as well as Ethel Rojo with her... coff-coff... ample cleavage! But then again are my points too positive? I've seen this film in many other guises. And each time I've always liked watching them but only if they did something cinematically different. Granted, this one did here and there. And it did it with some style too. Yet is that enough? Well? Yes and no I suppose. And funnily enough, I can say exactly the same thing about the following filmic facts. Ha! (1) 'Jaguar Films' first released this production in Italy on the exact same day Paula Murphy managed to set the female land speed record. It was on the 12th of November, 1964. (2) Loosely translated, this project was entitled 'Sheriff Versus Expert Marksman' in Denmark; 'Tough Avengers' in Greece, and 'Revenge of the Hurricane' in Turkey. (3) Even though the majority of this movie was shot at 'Elios Studios', situated in Rome, Italy, quite a lot of it was also shot on location in Spain. Most notably, Colmenar Viejo, Manzanares el Real, and Torrelaguna, based in Madrid, as well as Esplugues de Llobregat, situated in Barcelona. (4) One of the taglines used to promote this picture, was, 'The Sightless Gunman, Who Killed By Sound!'. (5) Now there are two versions of this film where it's ending was either very uplifting or very depressing. In one of them you'll see the main protagonist dead on the floor. And in the other you'll see him attending a wedding whilst wearing a pair of glasses. (6) Piero Piccioni composed the music for this movie and some of it was actually used in the 'RockStar' produced video-game, 'Red Dead Revolver'. (7) If you look very-very closely at the 2012 Quentin Tarantino spaghetti western, 'Django Unchained', you might be able to see a film still of this feature denoting 'Minnesota Clay Saloon'. (8) After this adventure went to the opticians, Cameron Mitchell starred in the TV series, 'Court Martial'; Georges Riviere starred in the drama, 'The Glass Cage'; and Ethel Rojo starred in the western, 'Doomed Fort'. 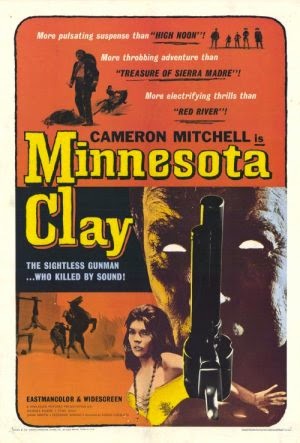 Overall I'd say 'Minnesota Clay' was a pretty good film to watch. Was it an original film to watch? No. Not really. Nonetheless, if you're ever in the mood to spend some time with a repackaged spaghetti western about a visually impaired gunfighter, this would be a fairly good place to start. Nuff said. Jumbled review. So sorry.